I used Complete Tissue & Bone by Christophers Original Formulas while I was recovering from a broken bone. My doctor was amazed at how fast I was healing. Complete Tissue & Bone - 100 Vegetarian Capsules from Christopher’s Original Formulas® is a synergistic blend of herbs for better bones‚ tissues and cartilage. Bones play a major role in our body to provide better structure‚ for protecting organs and to anchor muscles. 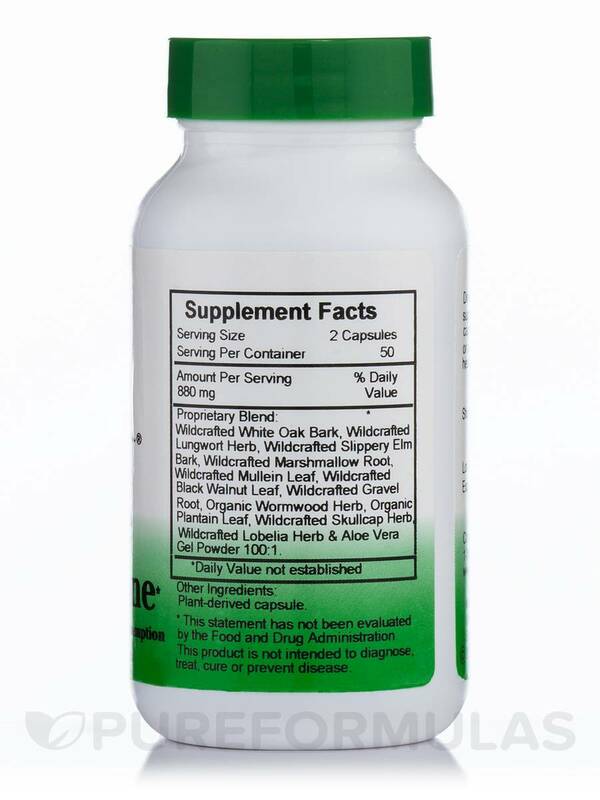 It is very essential to maintain healthy bones to aid in better ageing process. 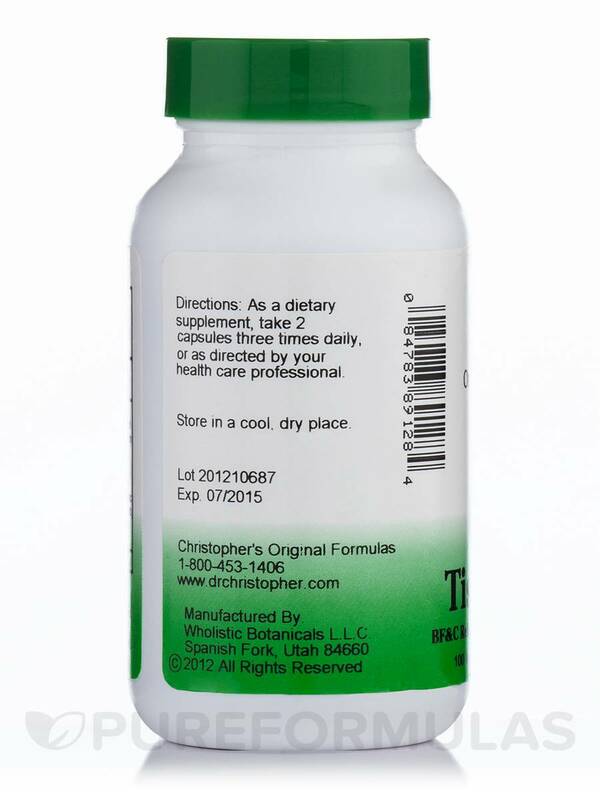 This time-tested Christopher’s Original Formulas® contains vital herbs and nutrients to support better tissues‚ bones‚ hair‚ nails‚ teeth and gums. White oak bark and Marshmallow Root extracts contain tannins that help with reducing inflammation and pain. There are people who believe that extracts from the lungwort herb may help drying of wounds. There are people who believe that mullein root extracts may work well to prevent joint pains‚ while Black Walnut Leaf contain tannins that may also reduce pain and swelling. Herbalists believe that lobelia herb may help to ease joint lumps and muscle pains. With a whole lot of herbs in Complete Tissue & Bone - 100 Vegetarian Capsules from Christopher’s Original Formulas®‚ you may be sure of better bones‚ cartilage and tissues. White Oak Bark‚ Lungwort Herb‚ Marshmallow Root‚ Mullein Leaf‚ Black Walnut Leaf‚ Gravel Root‚ Slippery Elm Bark‚ Wormwood Herb‚ Plantain Leaf‚ Lobelia Herb‚ Skullcap Herb & Aloe Vera 100:1. JUST STARTED TAKING COMPLETE TISSUE & BONE BY CHRISTOPHERS ORIGINAL FORMULAS. DR. CHRISTOPHER'S BRAND IS TRUST WORTHY. I ordered Complete Tissue & Bone by Christophers Original Formulas to see if it would help our daughter with her knee pain. It came highly recommend by mine sister & nephews who it has helped alot!! Our daughter has started it but has only been on it for 3 days so I don't know how it will help her yet. 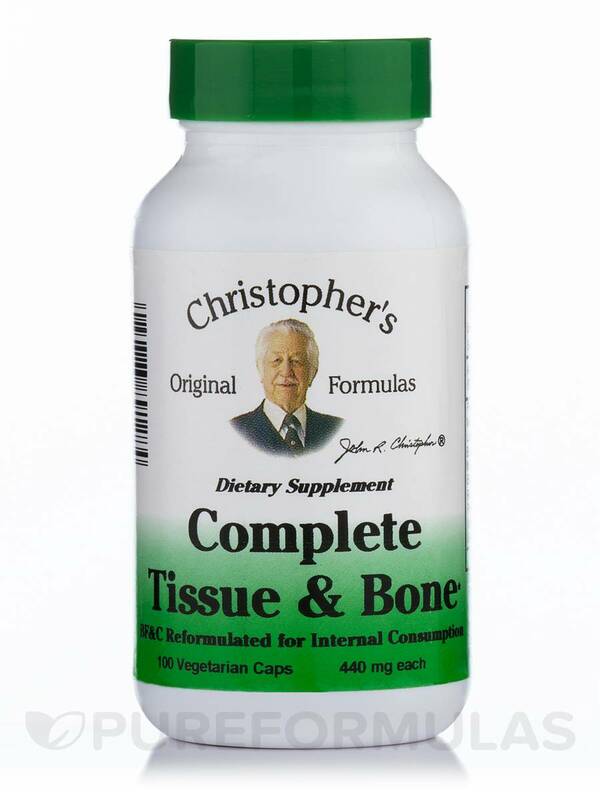 I take Complete Tissue & Bone by Christophers Original Formulas with the tissue and bone cream, together they work great. Put the cream on my stiff neck-relief right away, it took a few days longer to work on my back. I love the natural Dr. Christopher products. I injure my shoulder at work. The tendons were worn and weakened from repeated use of my arm. It got so bad that it began to affect my neck which turned into headaches. Chiropractic treatments were very expensive and wasnt quite as effective as Id hoped. Began using this blend and in just 1 week the pain and tenderness was gone. the strength returned in 30 days of use. I really wasnt expecting such a quick turnaround. Shoulder injuries usually take up to 1 full year. Thank you Dr Christopher!!! Complete Tissue & Bone helped to heal my husbands knee after physical therapy didnt work. Within 3 weeks is was healed! Its all natural and affordable!